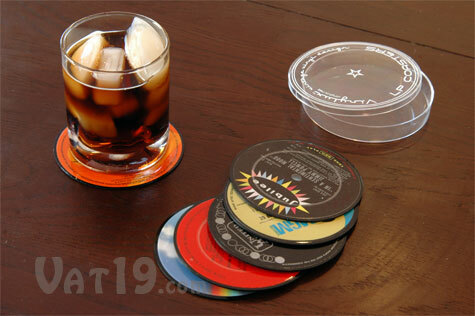 A set of 6 coasters made from recycled vinyl records. Audiophiles may cringe at the thought of turning old LP records into drink coasters, but we think it's a great re-use of old technology. Our Recycled Record Coasters are made by carefully trimming record labels from vintage LPs. A thin ring of black vinyl is left around the edges and is smoothed down. Both sides are then laminated to protect your furniture from scuffs and the label from moisture. Each set of six record coasters is packaged in a plastic storage case. LP coasters will feature completely random artists from all eras of music (which makes them so exciting to give and receive as a gift!). Now that a device the size of a silver dollar can store and play 5,000 songs, there's a lot of vintage vinyl out there collecting dust. 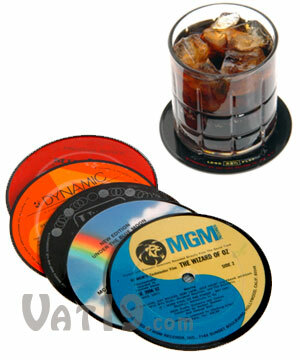 Breathe a second life into those old records with our LP Record Coasters. Each set of six coasters features a random collection of records from various musical genres. So you could very easily have some Herb Alpert and the Tijuana Brass mixed in with Pink Floyd's Dark Side of the Moon. Each coaster has been carefully trimmed to a 4" diameter and laminated on both sides (yes, records were double-sided). The lamination protects your furniture from being scuffed and the record label from moisture. Curious what happens to the rest of the record? Check out our Record Cuffs and Record Frame! 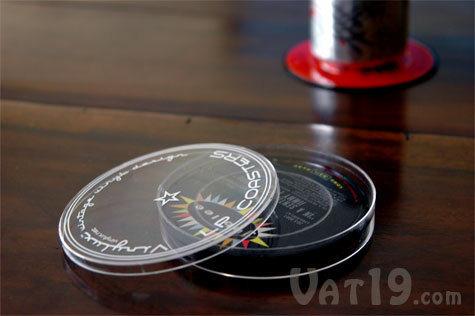 Each Record Coaster has been laminated on both sides to protect your furniture. Each set of 6 LP Record Coasters comes in a handy plastic storage case. Your set of six LP Record Coasters comes in a plastic storage case. Clever flasks designed to look like everyday objects.